Cornwall, United Kingdom part of a popular beach was cordoned off by police after it was a reported that a suspect item resembling a sea mine washed ashore. The Coastguard and police responded and setup a 150 foot exclusion zone around the item as they awaited for a Royal Navy EOD to arrive. EOD based in Plymouth in the early evening to investigate. According to reports from the incident, initial design features of the item including the shape, size and condition suggested that they item was a sea mine. However, after further investigation and removal of sand, the item was found to be the lid of a barbecue. Fairbanks, Alaska A portion of Richardson Highway was shut down by Alaskan State Troopers for about two hours after a 28-year old resident reported a possible UXO in the road. The resident reported seeing a 61 mm mortar round along mile post 352. State troopers contacted Eielson AFB's EOD unit for assistance as they responded to the scene. The Alaska Department of Transportation was also called in to erect temporary detour signs and barricades. However, after further investigation the suspect item turned out not to be a mortar or even a munition at all as authorities identified the item as a part of a driveshaft from a vehicle. After the scene was clear, the highway was reopened to traffic. Bretten, Germany An 81-year-old German man called police claiming to have found a WWII-era bomb in his garden. 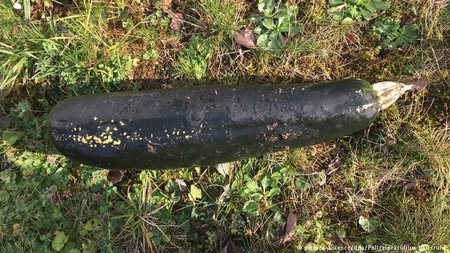 Police responded to the scene and were relieved to find that the "bomb" turned out to be a particularly large zucchini plant. 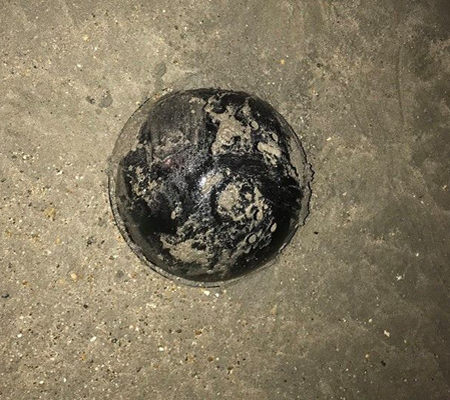 Salcombe, United Kingdom A Royal Navy bomb disposal team was called to the area of Rickham Sands after tourists spotted what they thought was a UXO partially buried in the sand. Wishing all our readers a very happy and safe 4th of July holiday. As we celebrate the birth of a country, UXOInfo honors all who fought for that independence and those who continue to serve to insure those freedoms. We especially like to thank all of those who have served and those who continue to serve in EOD. We also like to thank and recognize the civilian bomb disposal community as well who undoubtedly will be busy on this holiday responding to fireworks related incidents. We know that our readers understand and respect the hazards from explosives. 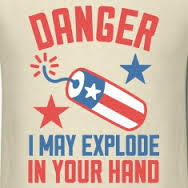 So, this reminder that fireworks are dangerous and should only be handled by trained professionals is for the general public. Today marks one of the most important days on the calendar! 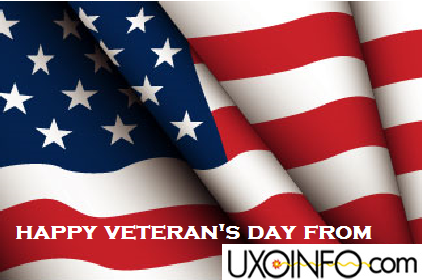 A heartfelt thanks from the UXOInfo.com Staff to all who have served the United States of America as a member of the military. 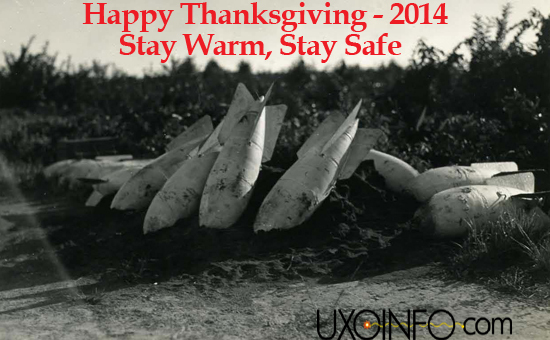 We salute your tireless dedication and sacrifice and send out a special thanks to our EOD brothers and sisters who have kept us safe from threats of UXO in the US and abroad. This is your day - have a great one! Fort Bragg, North Carolina A soldier made a poor choice when he decided to dress up as a suicide bomber for Halloween. The costume, complete with a simulated explosive vest, caused an emergency response at Fort Bragg when he attempted to gain access to the Base through one of the access control points. In a written statement about the incident, officials said, "The incident resulted in an emergency response, EOD clearing the entire scene and an extended closure of a gate." It was determined that the soldier was wearing a Halloween costume, but a reminder was issued that such costumes are banned on the Base. Article Submitted By: USACE Huntsville Center representative. Huntsville, Alabama After more than 24 years of civil service, Charles (Chuck) Twing, chief, Chemical Warfare Design Center, retires March 31. His accomplishments were recognized during a March 20 retirement ceremony attended by current and past Huntsville Center employees as well as representatives from Redstone Arsenal and other Army agencies outside the USACE and Huntsville Center realm. "These people didn't have to come to the Center on a rainy day like today, but they showed up and that is a testament to you Chuck", said Col. Robert Ruch, Huntsville Center commander. "That speaks strongly to the support you've given." Prior to his hiring in 1990 as the second UXO safety specialist brought on board at the U.S. Army Corps of Engineers, Huntsville Division, Twing served 20 years in the active-duty Army as an EOD officer. Motpellier Beach, France Authorities are concerned that a 15-ton dead whale that washed ashore could explode at anytime due to gases forming inside the carcass as it decays. One option under consideration to control the threat is to conduct an "open detonation" procedure using commercial demolition explosives. In this scenario, the whale carcass would be first towed out to sea a safe distance from the beach before rigging explosives to destroy the carcass.